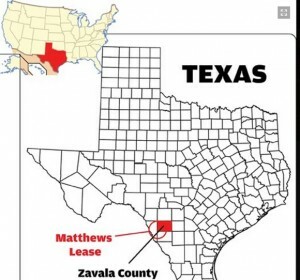 Eagleford Energy has entered a joint development agreement with Stratex Oil & Gas on the 2,629-acre Matthews Lease in Zavala County. Stratex will pay for the completion of the Matthews #1H and assume necessary payments to maintain the Matthews Lease. Stratex paid $150,000 to the lessors in early December and will pay an additional $150,000 to Eagleford Energy to earn the right to participate in the lease. Once the well is completed, Stratex will earn a 66.7% interest before pay out and a 50% interest after payout in the well. The Matthews #1H has already been drilled, logged, and core has been analyzed by Weatherford. The Matthews #3H and an 80-acre tract around the well are being retained by Eagleford Energy.